Welcome to the Bro monthly newsletter, which for the month of December features the Bro annual newsletter, recapping the events of 2014. New resources for the community: 2014 the Bro community gained many new resources to learn, teach, and get help with using Bro. Bro impact: an overview of Bro's visibility and impact in terms of statistics and awards. Security is broken: highlights of the security breaches we saw in 2014. Bro dev: new developments, major releases. Bro research: along with being a widely used NSM, Bro also both enables research and itself inspires research and innovation. Troopers 2014 — March 2014. Talk: Bro: A Flexible Open-Source Platform for Comprehensive Network Security Monitoring. Slides. The Bro Team presented a members-only two-day Bro training workshop for the Department of Energy. Over the last year the Bro team continued to improve the usability of Bro, also in terms of resources, such as documentation. In this section we want to focus on new developments. The Bro Center of Expertise is a central point of contact for institutions funded by the National Science Foundation (NSF) that bundles the Bro Team’s expertise and offers it to NSF-supported sites seeking advice. The Center provides the umbrella for many of the efforts we discuss in the following. The More You Bro is a series about various features of Bro, taught in the format of a hands-on tutorial. The episodes are intentionally brief to keep the content focused and approachable to new learners. Interested in suggesting a topic? Send us an email at info@bro.org or Tweet us @Bro_IDS. The Bro Teaching Community aims to create a knowledge base and resource collection for educators, ranging from example curricula and slide sets to exercises for all purposes and skills levels. By coordinating and synchronizing existing and future teaching efforts, we want to help share materials, and exchange “lessons learned” from different settings. With members of the core Bro team involved, the Community also helps with technical questions and provides guidance on using Bro effectively. The Bro Teaching Community offers a bi-weekly meeting as well as access to a restricted git repository where we collect reusable teaching material. In the meetings we discuss possible curricula, technical problems, and other related topics. The Bro Teaching Community is a collaboration of the Bro core team and interested university faculty. Get in touch via info@bro.org. Teaching, learning, and testing are activities that are sometimes hard to distinguish. They all need a non-disruptive space to enable exploration without risking harm to productive systems. In 2014 the Bro team released two new tools that allow you and your students to explore Bro in a safe way. Bro Live! is a training system that gives users hands-on access to a Bro learning environment without having to install a virtual machine and deal with associated dependencies. Bro Live! can be built with exercises for a given class or workshop, with access to the environment limited to the duration of the event if desired. All the user needs is an SSH client and Internet access. Bro Live! is a Linux-based sandbox system, relying on Linux containers, OpenSSH, and Docker. It places the user in their own isolated environment with shell access to Bro, the exercises, and the standard Unix toolset. The user's work is saved in their container typically for the duration of the training event and can be easily re-attached at anytime during the event to continue their work. To use Bro Live! download it from Github. The work on Bro Live! led to the development of ISLET. ISLET, the Isolated, Scalable, and Lightweight Environment for Training, is a platform used to teach Linux-based software that reduces the administrative overheard of building training environments and ensures a smoother training experience for users than comparable virtual appliance-based training. We intend ISLET to provide an improved replacement to event training that relies on virtual machines. It excels at quickly providing user's with shell access to containers to play with network security and other Linux based tools. The official BroLive! training image works with ISLET, and we launched a precursor at BroCon14. Try.bro.org is a web-based scripting sandbox made freely available to users on our site. No login. No installation. No trouble. We have included a few basic scripts and pcaps to help users get started. Users can paste their own scripts or upload their own pcaps. The environment includes version control to test your scripts against current or previous versions of Bro. In addition, Try.bro caches a user's work and generates unique URLs to enable sharing with others. No more copying and pasting scripts or log files, just send the link. We store code fragments for three days and pcaps for one hour, resetting the timeout when the link is used. Since the make-over of Bro in 2012, which specifically targeted better usability for production deployments, Bro has attracted more users every year. All the Bro 2.x releases were enabled by an NSF award that ended in 2014, with the NSF Center now continuing that work. With the number of users, the number of contributors and third party scripts and extensions grew as well. In this section we sketch these developments. InfoWorld awarded Bro a 2014 "Bossie Award" in the category "The best open source networking and security software", and they also included Bro into their list of "11 open source security tools catching fire on GitHub". Indeed, Bro is at the top of GitHub's security showcases list now and has more than 640 stars. We typically see about 10,000 direct downloads per version from our main server. These tend to come from a couple thousand unique ASNs across about 150 countries. These numbers do not include downloads from GitHub, nor what has arguably become the most common way for new users to get started with Bro: Security Onion, a Linux-based live DVD environment tailored to security monitoring, which includes Bro as a key component. During the recent years attendance at our annual Bro user meetings grew from originally 30-50 people to 150 attendees from 60 different institutions at the 2014 event. Our Twitter account shows almost 3,000 followers, and the main Bro mailing list now reaches close to 1,000 people. 2014 saw a number severe security incidents, many of them concerning TLS/SSL. Here is a collection of some of the most important cases. The Heartbleed vulnerability in the widely used OpenSSL library can reveal memory contents of processes running OpenSSL, which can include highly sensitive data such as encryption key material. Due to the ease of exploiting it and the large number of vulnerable servers, the vulnerability was very widely reported, and represents one of the most serious security problems in the Internet this year. Bro includes a thorough detection script that can alert users if Heartbleed exploits are performed on their network. As usual, Bro will write the corresponding notices to notice.log. In other words, this bug allows anyone to execute their own code on affected remote hosts! Even worse, if a vulnerable server runs as root, an attacker exploiting the vulnerability can immediately, and trivially, acquire full control over the server's system. Blog post: The SSLv3 #Poodle Attack & current SSL usage statistics from the ICSI SSL Notary (http://t.co/lJeHc1DGNc). — ICSI Notary (@ICSInotary) October 17, 2014. During the last year Bro was developed further and extended. This section presents a snippet of the coding news from the Bro universe. The release of 2.3 freed Bro from its dependency on Libmagic. The release brought (among other things) new SSL functionality, e.g., to detect the Heartbleed vulnerability; analyzers for SNMP and Radius; and extended capabilities for PF_Ring. Users still operating on 2.2 go can find out what's exciting about 2.3. We are happy to announce an initial prototype of Packet Bricks, a new Bro-related project written by Asim Jamshed from KAIST, who visited the Bro team in Berkeley over the summer. Packet Bricks - which is still under active development - is a Linux/FreeBSD daemon that is capable of receiving and distributing ingress traffic to user-land applications. Its main responsibilities will eventually include: (i) load-balancing, (ii) duplicating, and/or (iii) filtering ingress traffic across all registered applications. The distribution is flow-aware (i.e., packets of one connection will always end up in the same application). Packet Bricks leverages the netmap packet I/O framework for handling packets efficiently, and employs netmap pipes to forward packets to user-land applications. Packet Bricks is available on github. It's still a very early piece of software, and we announce it at this time primarily for users willing to help us collect some first experiences with it. If you have any feedback, please send it to the Bro development mailing list. If you aren't subscribed yet, do so here. Bro's powerful capabilities to analyze traffic makes it a powerful research tool, as well as itself serving as a domain for research. In the context of ICSI's ongoing research projects, we developed a prototype of BinPAC++. BinPAC++ is a next-generation parser generator that makes it easy to build parsers for network protocols, file formats, and more. It provides a comprehensive system that enables developers to write attributed grammars defining both syntax and semantics of an input format inside a single comprehensive scripting language. The BinPAC++ toolchain, built on top of HILTI, turns such grammars into efficient parsing code that exposes a well-defined C interface to its host application for feeding in input and retrieving results. At runtime, parsing proceeds fully incrementally—and potentially in parallel—on input streams of arbitrary size. Compilation takes place either statically at build time, or just-in-time at startup. You might have seen Robin Sommer's demo at BroCon'14. If you want to try it out, you can fetch the code, though keep in mind that it is still a prototype and not yet production-ready. Here is an overview of this year's research output. The list contains publications of Bro team members but also external publications that use or extend Bro for their work. Please note that we do NOT know if this list is complete, there might be more publications out there and you are invited to let us know about each of them. Welcome to the 1st Bro Monthly, our new monthly newsletter covering the latest developments in the Bro universe. This newsletter will appear every month, around the 15th, as a Bro blog post. Please send feedback, wishes, and suggestions to info@bro.org or @Bro_IDS on Twitter. BroCon'14 was held at NCSA from August 18th - 20th. This year we received almost 150 attendees, our largest Bro event ever! Arista, Northrop Grumman, NSF, Reservoir Labs, and Security Onion Solutions. A big thank you goes to NCSA who helped organizing the event. such as Bro Live! and Try.Bro (see below). Nick Buraglio from ESnet talked about "Best practices for securing the science DMZ". Bob Rotsted from Reservoir Labs discussed the "Value of context when detecting adversaries". Johanna Amann from ICSI presented the new SSL analyzer in Bro 2.3 that is also capable of detecting the Heartbleed exploit. Michael Pananen from Vigilant Technology Solutions showed how he automated Bro's installation, upgrade, and configuration using puppet. Kurt Grutzmacher from Cisco Security Solutions presented OpenSOC, a Hadoop solution to extend Bro's ingestion capacity to 1.2 million packets per second and more. Aashish Sharma gave some very entertaining insights into his day-to-day work fighting off attacks at LBNL. Matthias Vallentin from ICSI introduced VAST (Visibility Across Space and Time), a large-scale network forensics platform. Robin Sommer's (ICSI/LBNL/Broala) live demonstration of the new BinPAC++ parser generator was one of the most resonating contributions. He implemented a full protocol parser in less than half an hour in front of the audience. To conclude the day Seth Hall (ICSI/LBNL/Broala) talked about the future of Bro, giving insights into long term and short term plans. The third day was opened by Bob Bregant from the University of Illinois, who talked about how Arista's "DANZ" software can be used in combination with Bro to balance the costs when monitoring large high speed networks, working around problems arising from aggregation and traffic splitting. The third day was wrapped up by a panel discussion in which the audience had the chance to pick the Bro team's brains about their visions for the Bro project. Apart from the talks and demos we had five exercises ranging from beginner level to quite advanced scripting challenges. The exercises can be found at the event site of BroCon'14 . The solutions will be given out on demand. Please contact info@bro.org. The videos of most of the BroCon'14 talks are now online. The Bro team respects the privacy preferences of our speakers, so when a speaker opted to not being recorded, we do not offer a video of the talk. The CTSC Summit was held in Arlington, VA on August 26th - 28th. The Bro team presented a one-day training to a smaller group of attendees affiliated with NSF projects. The training consisted of a couple exercises from BroCon '14 as well as some presentations. Robin Sommer also gave an overview of the Bro Center of Expertise at the main event on August 27, 2014, in which he presented our latest efforts for making Bro more accessible to the community, and enable people and institutions to use Bro more effectively. Bro v2.3.1 has been released. This release addresses a potential DOS vector using specially crafted DNS packets. It also fixes a bug in the OCSP validation code that could lead to crashes as well as a memory leak. The source distribution and binary packages are available on our downloads page. See CHANGES for the full commit list. Since this release addresses a bug fix, we encourage users to review and install at their earliest convenience. Feedback is encouraged and should be sent to the Bro mailing list . Any who has tried to add a new protocol analyzer to Bro will havenoticed that so far that has required touching a lot of pieces of Bro, as well as a complete rebuild of the Bro code base. We have just added a new comprehensive plugin infrastructure to Bro that makes this process much easier by allowing to write protocol analyzers externally, without *any* changes to the Bro core, by compiling them into a shared library that Bro will then load at runtime. That way, the custom code remains self-contained, and can be maintained and installed independently. This new infrastructure is in fact not limited to protocol analyzers, but supports other components of Bro as well. Developers can now use plugins also to provide custom file analyzers, log writers, input readers, packet sources and dumpers, as well as new built-in functions. For more information, see the introduction to writing Bro plugins. We are happy to present an initial prototype of Packet Bricks, a new Bro-related project written by Asim Jamshed from KAIST, who visited the Bro team in Berkeley over the summer. Packet Bricks - which is still under active development - is a Linux/FreeBSD daemon that is capable of receiving and distributing ingress traffic to userland applications. Its main responsibilities will eventually include (i) load-balancing, (ii) duplicating and/or (iii) filtering ingress traffic across all registered applications. The distribution is flow-aware (i.e., packets of one connection will always end up in the same application). Packet Bricks leverages the netmap packet I/O framework for handling packets efficiently, and employs netmap pipes to forward packets to userland applications. Packet Bricks is available on github. It's still a very early piece of software, and we announce it at this time primarily for user's willing to help us collect some first experiences with it. If you have any feedback, please send it to the Bro development mailing list. If you aren't subscribed yet, you can do so here. “@runasand: @Bro_IDS Hey, could you please enable SSL by default on your website?” < Done. In August we launched three new projects that aim at helping the Bro community use, learn, and teach (with) Bro. We are happy to announce the newly started Bro Teaching Community, a community project of educators interested in collaboratively exploring Bro's use as a teaching tool, and sharing experiences and material. The goal is to create a knowledge base and resource collection for educators, ranging from example curricula and slide sets to exercises for all purposes and skills levels. We provide logistics and technical advice, e.g., weekly calls, a mailing list, a repository with seed material, and access to the Bro team. To learn more please visit our Teaching Site. The Bro Playground is a new part of the Bro Community resources. It is a collection of tools and toys to assist you. Whether you want to teach Bro, use Bro for teaching others, teach yourself, or try something out “quickly” without impacting your live system, this is the place to look for the right tool for your use case. Try.Bro - as simple as that! 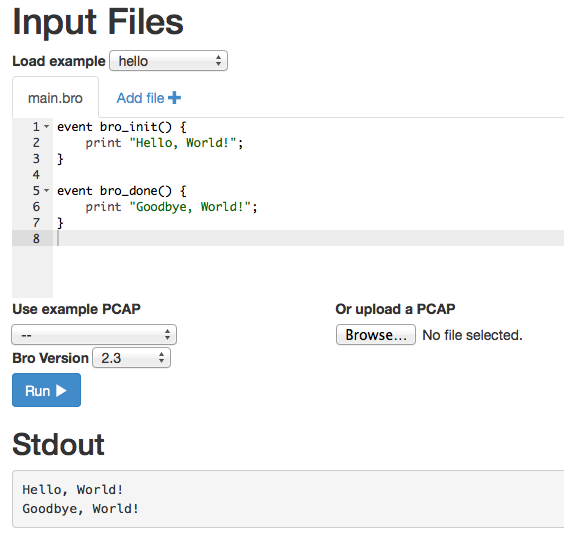 We have included a few basic scripts and pcaps to help get you started. You can paste your own scripts or upload your own pcaps, too. We even included the option of chosing different Bro versions to test your scripts against current or previous releases. And, last but not least, Try.bro temporarily caches your work and generates a unique URL to share with others. No more copying and pasting scripts or log files, just send the link. We store code fragments for three days and pcaps for one hour. The timeout is reset when the link is used. To learn more please refer to the blog post. We are excited to announce the public release of Bro Live! Bro Live! is a training system that gives users hands-on access to a Bro learning environment without having to download a virtual machine or its required dependencies. Bro Live! may be built with exercises for a given class or workshop and access to the environment may be limited to the duration of the event. All the user needs is an SSH client with access to the Internet. Please read our latest Blog post. Robert Rotsted from Reservoir Labs posted on the Bro mailing list about the new Exfil Framework. "The Exfil Framework is a suite of Bro scripts that detect file uploads in TCP connections. The Exfil Framework can detect file uploads in most TCP sessions including sessions that have encrypted payloads (SCP,SFTP,HTTPS). The inspiration for Bro Live! came from the frequent frustrations we faced when building and distributing virtual machines for our training events: files are too large, the variety of user platforms and virtualization products complicate the troubleshooting process, pushing last minute updates are difficult, too much time spent not learning Bro, etc. Bro Live! overcomes all of these limitations by putting the responsibility back in the hands of the system engineers. Users simply open a terminal, connect to the server via ssh, create an account, and they are up and running. How Does Bro Live! work? Bro Live! was built using Linux, OpenSSH, Docker, and Bash to glue everything together. It relies on Linux-based containers, managed by Docker, to place users in their own isolated environments with shell access to Bro, the exercises, and the standard Unix toolset. The user's work is saved in their container typically for the duration of the training event and can be easily re-attached at anytime during the event to continue their work. Want to host your own Bro training event with a system like this? See our work in Github for more information. As always we welcome your feedback and bug reports, contact us at info@bro.org, follow us on Twitter, or like us on Facebook. A few days ago, Google announced their plans for sunsetting certificates using the SHA-1 hash algorithm in the near future. Google does not think SHA-1 certificates should be considered secure in the future anymore as collision attacks against SHA-1 get more realistic. For these reasons, they will start reducing the security indicators if the certificate chain uses SHA-1 and the host-certificate is valid beyond the end of 2015. Depending on the exact validity in the certificate, the visual display will first change to a symbol showing slight errors in the HTTPS connection to symbols showing the connection to be not secure. Chrome will start reducing the security indications for such certificates at the end of September 2014. We created a Bro script that can detect servers in your local network that contain such certificates. To use the script, simply download it from https://github.com/0xxon/bro-scripts/blob/master/chrome-sha1.bro and either load it in your local.bro (when using broctl) or add it to the Bro command line when starting it manually. By default the script only checks servers that are in your Site::local_nets list. The script will output notices for each server containing such certificates to notice.log. An example output is included in the git repository. Please let us know any issues you encounter when using this script. Bro v2.3.1 has been released. This release addresses a potential DOS vector using specially crafted DNS packets. It also fixes a bug in the OCSP validation code that could lead to crashes as well as a memory leak. The source distribution and binary packages are available on our downloads page. See CHANGES for the full commit list. Since this release addresses a bug fix, we encourage users to review and install at their earliest convenience. We are very excited to announce the official launch of Try.bro.org! Try.bro is a web-based scripting sandbox made freely available to users on our site. No login. No installation. No trouble. We have included a few basic scripts and pcaps to help get you started. You can paste your own scripts or upload your own pcaps, too. We even included the option of version control to test your scripts against current or previous versions of Bro. And, last but not least, Try.bro temporarily caches your work and generates a unique URL to share with others. No more copying and pasting scripts or log files, just send the link. We store code fragments for three days and pcaps for one hour. The timeout is reset when the link is used. How does Try.bro work? Mainly we use Docker to run Bro in an isolated container. In the few weeks we have been beta testing Try.bro it has become an extremely useful tool for collaboration, troubleshooting problems with users, and more. We have additional features planned for Try.bro, including making it embeddable and building scripted tutorials around it for guided learning. If you find a cool use for Try.bro or want to request a feature/report a bug, please let us know. Contact us at info@bro.org, follow us on Twitter, or like us on Facebook. We are happy to announce the newly started Bro Teaching Community, a community project of educators interested in collaboratively exploring Bro's use as a teaching tool, and sharing experiences and material. The goal is to create a knowledge base and resource collection for educators, ranging from example curricula and slide sets to exercises for all purposes and skills levels. We invite you to participate in our open discussion every Tuesday at 10:00 AM PDT. In these meetings we discuss planned curricula, practical and technical topics around exercises, slide sets, and general questions related to teaching security, networks and systems with Bro. We are happy to announce the release of Bro v2.3. The source distribution and binary packages are available on our downloads page. For a brief overview of new features and bug fixes you may review our previous blog post about the v2.3 beta. See NEWS for the preliminary release notes and CHANGES for the exhaustive commit list. We are happy to announce the public beta of Bro v2.3 is available for download! The majority of our development time has been focused on improving performance, reliability, and memory use. Feedback is encouraged and should be sent to the Bro mailing list. As we have stated in the past, we do not recommend using a beta release for production use. We just added support to Bro to detect the recent heartbleed attack on TLS servers that are using OpenSSL 1.0.1a-f. In TLS the payload size of a heartbeat packet and the size of the whole packet is specified in two different places. The heartbleed attack exploits the fact - vulnerable OpenSSL versions return random bits of server memory, when the request packet specified that the payload size is bigger then the size of the whole data packet. Bro can detect this attack in several different ways. In the simplest incarnation, which is the only one we have seen in the wild so far, the heartbeat message is sent very early, before the TLS encryption kicks in. In these cases, Bro just compares the payload and message sizes. If there is a mismatch, we know that an exploit has been tried. If the server responds to the message it very probably was vulnerable to the attack. In theory, the attack also can take place after the TLS encryption started. In this case, we only know the message size, the payload size in the request is encrypted. In these cases, we use several different heuristics to deduce when an attack is taking place. We count the numbers of heartbeats sent by the client and the server. If there is a divergence of more than a few packets, an attack is likely. We also check if TLS heartbeat messages are smaller then the minimal length they are required to have, which probably also is only the case in an attack. Furthermore, we check if the encrypted heartbeat packets returned by the server have the same size as the packets sent by the client. If they diverge, the server is returning more data than the client sent in the first place -- which only can happen due to this attack. The alerts will be written into notice.log.